Marlene's sister is visiting us. She came from Arizona to attend a memorial service for a recently-deceased family member. After the service, I overheard Marlene and her sister talking in our kitchen about planning out a funeral or memorial service. Marlene told her sister that I wanted a particular hymn sung at my service, but she couldn't remember what it was. Then Marlene came and asked me to remind her what hymn it was that I wanted. Offhand, I couldn't recall. I think we have sung a few different hymns in church over the years, and I have whispered to Marlene afterwards that I'd like that one at my funeral. 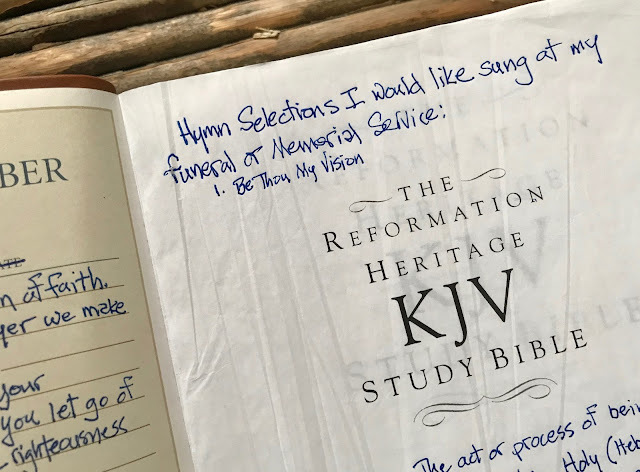 So it occurred to me that I should write down a few favorite hymns for my funeral inside my Bible. I told Marlene that I would do that. A couple minutes later, I remembered that Be Thou My Vision is the hymn I like most (my ability to recall things seems to be flagging some lately, and it concerns me). As I was listening to the YouTube clip above, Marlene came back and said that she thought that was the one. Then she said, with a kindly smile, "I'll get some pipes for you too," which made me smile back (she knows what I like). I told her that was okay. I don't want to complicate the event. I mean, we don't know any pipers. And then, Marlene pointed her finger at me and said, "But don't you go too soon!" Nathan Pacheco sings this with such heartfelt emotion. Thank you for sharing this post. I think that is the most beautiful rendition of that hymn that I've ever heard. Thanks for sharing that. Elizabeth L. Johnson said, It's clear he is worshipping. Nice post! I’m not having a funeral, but if I did I would pick “HOW GREAT THOU ART”. I like your pick...good one for John. A Funeral Sermon all in Hymns sounds like a great idea!